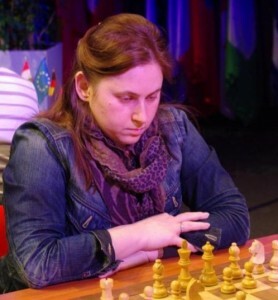 Although conceding a last round draw meant Polgar finished in third place on tiebreaks behind Potkin and Radosław Wojtaszek, her 7 wins in 11 games were a reminder of the dazzling attacking play she’s used to wow the chess world throughout her career. In the interview at Chess-News she talked about her tournament, including the decision not to take any risks in the final round, but also about how her game’s changed over time, where she gets the motivation to keep playing, her encounters with Karpov and Kasparov, and the prospect of playing in women’s events. How do you rate your own performance? Or rather: what ambitions did you have when you travelled to the European Championship in France? In principle, my ambition was to qualify for the World Cup which is taking place in Khanty-Mansiysk this August. At the same time I wanted to play well, and then, I thought, let’s see what happens. It went very well. I played a few fine games, particularly from the seventh to the tenth round. For example, I managed to win a few beautiful endgames, and I was very pleased with my play. Judging by what you said about your main aim being to qualify for the World Cup, that seems to explain why you decided not to fight Potkin for first place in the final round? Yes, the last round is always tough, when you’re considering what to do, how to play. It depends on whether you’ve got enough energy left. I’d previously won four games in a row, and didn’t have much energy left for the last round. I didn’t know how exactly to play for a win in those conditions, to fight for 4-5 hours. Meanwhile, I could see that Potkin was in very good form. When someone wanted to beat him… for example, in the ninth round Jobava really wanted to win but things went badly and he lost in a very beautiful manner. So I felt that perhaps this wasn’t the tournament in which to play sharply for a win against Potkin. Maybe ten years ago I’d have played for a win, but now I realised that the tournament had gone well, and if I played for a win with Black then it would in any case be a very long struggle. Losing definitely wasn’t something I wanted, and somehow I felt that in the given circumstances a draw was a good result. After the tournament it would become clear if that was enough for second or third place. I was very pleased with how I’d played my games, and therefore I felt that such a result could be considered good. You said that ten years ago you’d maybe have played for a win in the last game. Does that mean that as time’s gone by – ten years or even more have passed – you’ve perhaps become a wiser player, or you’ve somehow matured? No, I think experience is very important both in my own life, and that of other chess players. I now spend more time wondering what’s going to happen next. When I was young – 16-18-20 years old – back then I didn’t think a lot about how I’d feel if something didn’t work out. And now I wonder: what can I lose and what can I win in the last round? Of course, if I’d won it would have been fantastic both for me and for the press, and so on. But I felt that given the way I’d played recently, it was enough for me that I’d previously won four games in a row in good style. And I thought there was no need to take risks in the last round. It’s simply experience. Perhaps it’s good, but sometimes, of course, it can also have a negative effect. Tell me, Judit, your sisters are also famous players, but nowadays they no longer play chess. Or at the very least we don’t see them in strong tournaments. While you’ve given birth to two children, are a mother, and now probably have a lot of other concerns, but nevertheless you don’t only play chess but, as we can all see, you’ve practically returned to your previous level. Why? Why put yourself through that? I think it’s because I love chess. I love chess and I love to play. Of course, in 2007, 2008 and to a degree in 2009, I perhaps didn’t love chess quite as much given that I’d started playing badly. The quality of my games was low, and my results were bad. After that, of course, it was tough to play a lot. But then my children grew up a little – my youngest, Anna, is now 4.5 years old, while Oliver’s 6.5. Anna’s about to go to kindergarten, and in September Oliver’s starting school. And somehow I’ve started to work more in the last year and a half. It started with preparing for the World Cup, where I managed to win an interesting game against Gelfand. And then after that I wanted to play more. Perhaps it wasn’t noticeable as I haven’t played in a lot of tournaments. But then when I do play, I feel I’ve got a hunger for the game. But doesn’t it upset you that you’re not invited to elite round-robin tournaments at the moment? In principle, that’s life. I very quickly understood how it is. When you don’t have a high rating that’s what happens. If I don’t work every day then I’m not going to get invited just because I’m a woman and play better than other women. Such is life. I can’t say it’s pleasant, but I’ve come to terms with it and play when I can. We’ll see – perhaps there’ll be more tournaments. But I’m also thinking about doing other things, not only playing chess. Perhaps I’ll write a book and do some things for a school or a kindergarten. I’ve already written a short book with Sofia. So I’d do things connected to chess. And the books for children – they’ll also be on a chess theme, yes? Yes, of course. It’ll be interesting. Tell me, Judit, in your day you’ve beaten chess players of all levels, including both Kasparov and Karpov. I’m curious simply in human terms: what does a woman feel when she’s beaten Kasparov and Karpov? What did you feel at that moment? Can you express it in words? I don’t think it’s entirely right to talk about “as a woman”. When I played them I was already a good player. I was very small when I looked at the games of Karpov and Kasparov in the 80s. Of course, at that point I never thought that I’d get to play them. 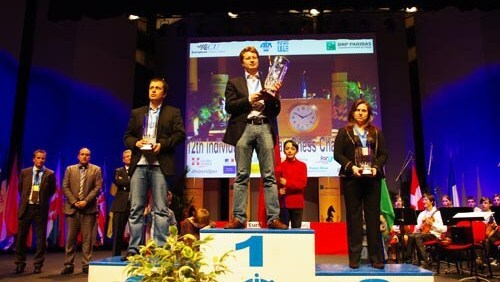 Yes, it was a very good feeling when I won, for example, a rapid chess match 5-3 against Karpov in Hungary. And, of course, I was very pleased when I beat Kasparov at rapid chess in Moscow. But for me the two games against him in Linares 2001 were much more memorable. With Black I played what he was playing himself – the Najdorf line with 6. Be3 Ng4 – and made a draw. And with White things were going badly, I sacrificed a piece, but Kasparov didn’t feel good and went for a draw. Those two games, for instance, have left a much greater imprint on my memory. Though of course it’s always nice to win, and particularly against legends. OK, I’ve got one last question to ask you. All your life you’ve only played in male tournaments. But wouldn’t you like, just once, to play in a strong women’s tournament (for example, in the World Championship or somewhere where the best female players would be present) and show everyone who’s who? In principle, I’ve always enjoyed challenges. My parents brought me up that way, and I never really thought that much about playing women. When I was playing in a lot of male tournaments it was normal for me. Of course, in the last 5-10 years a few women have also been working very seriously, with good trainers – like Kosteniuk, the Kosintsevas, Hou Yifan, Koneru… So there are already some very good players you could call professionals. I don’t know, perhaps in a few years I’ll play them. For now I don’t have any such intentions. I don’t rule out anything in life. I can’t say that I’ll never do it, as I can already see there are good players working seriously. So you see worthy adversaries? Yes, there’s Hou Yifan, Koneru and a few more. Many thanks, Judit. Thank you for sharing your time with us, and I hope you don’t stop there but continue your rise. 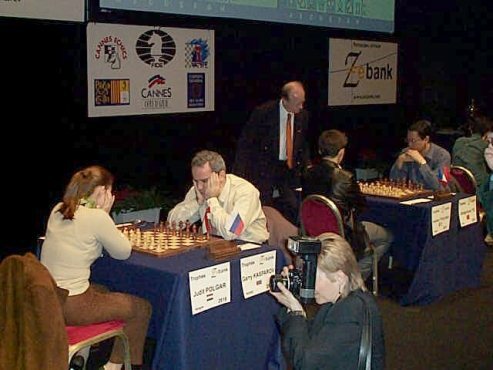 In the game viewer below you can first see Polgar’s two games against Kasparov in Linares 2001 (the second was named the game of the tournament, and mentioned in this ChessBase report on the round), and also her 7 wins from the European Championship. 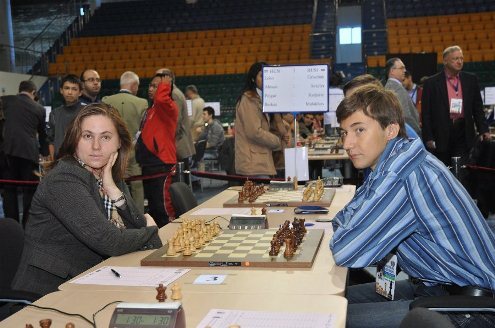 Note: you might want to take a look at Alexandra Kosteniuk’s chessblog.com, which has also posted a partial translation of Judit’s interview (I saw it after the above translation was nearly ready!). See also: Sergey Shipov’s commentary on one of Polgar’s most spectacular wins from the European Championship. I like “and show everyone who’s who?” part most! Its interesting that on Kosteniuk’s website this question if different..
Rio de Janeiro, 13 de abril de 2011. Another great interview well translated by this great site! Thanks very much for translating this interesting interview! Thanks for the comments! I just wanted to add that I’m on holiday at the moment so there probably won’t be many (any!?) updates in the next week and a half – normal service should be resumed soon after that! Mishanp I hope you had a good vacation but man it’s time to get back to work ! Waiting impatiently (biting nails) for the next article. Just back last night/this morning… I wasn’t really intending to maintain such perfect silence while away, but I did do some translating and should have a few things up soon! Man am I glad you are back !